My makeup bag is filled with an arsenal of tried and true products. Because of this my beauty routine does not change much with the seasons. But, over the last few months I've stepped out of my comfort zone and given a few new products a try. Ultimately, they were all winners and have found a happy place in my every growing makeup bag. 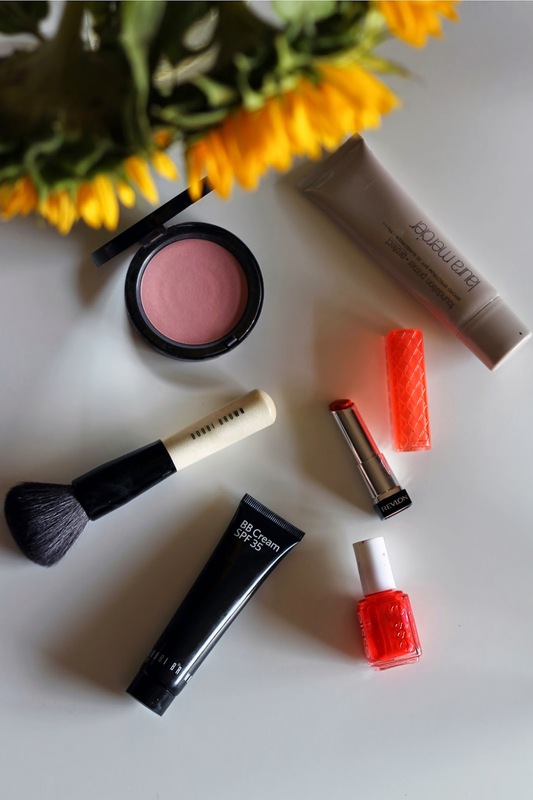 Below are a few of my favorites I'm loving during the warm and humid summer months. Bobbi Brown Illuminating Bronzing Powder & Bronzer Brush I am a huge fan of Bobbi Browns makeup. They carry one of the few foundations fair enough to match my complexion. I normally stick to blush because most bronzers give me an orange flush rather than a glowing complexion, but this illuminating bronzer is subtle enough for the fairest skin tones. I even splurged on the bronzer brush because when something works, it really works. Laura Mercier Foundation Primer Protect Broad Spectrum SPF 30 Living in a sorority house for a year gave me a vast amount knowledge on how to make your makeup look good (not necessarily natural), and last. Using a primer is key in the summer to keep your makeup from melting off. I use it every morning under my BB cream. It also has SPF 30 which is an added bonus during for sunny days. Revlon Color Burst Lip Butter This product is the perfect combination of a lipstick and lip balm. It provides the color and longevity of a lipstick with the hydration you expect in a balm. I have it in "Tutti Frutti" which is a punchy orange. Layer it on for a more dramatic effect. Essie Nail Color You can not go wrong with Essie nail polish. Each season, they offer an array of fresh seasonal colors. For summer, you really can not go wrong with a classic like Geranium. I've had it on my toes all summer, and I'm not giving it up any time soon. Bobbi Brown BB Cream SPF 35 I reach for this BB cream every morning. It provides great coverage without being heavy like some foundations (which is perfect for warmer climates). Since I started wearing it in May I've noticed a difference in my skin. It is clearer and brighter. Plus, with SPF 35 you know you are always protected. I will be wearing this year round.